3. Lemon is used to lighten hair. It is a super duper deep conditioner, some of my friends use it and it works miracle for them. I hope it will work for you too. 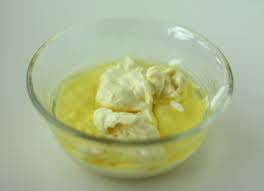 Take egg yolk of 3 eggs, 1/2 cup of olive oil and about 1 cup of mayonnaise. Blend all of these things together. Now apply thoroughly trough you hair, do not shampoo afterwards, just let the paste on your hair for 20 minutes and then rinse it with cold water. 1. Olive oil will make you hair look shiny.